NOTE: I wrote the following piece as my editorial statement for an online culture magazine for which I was to be the music editor. Sadly it folded before it saw the light of day. It in turn was based on an idea I originally had about ten years ago. Here it is, very lightly edited. 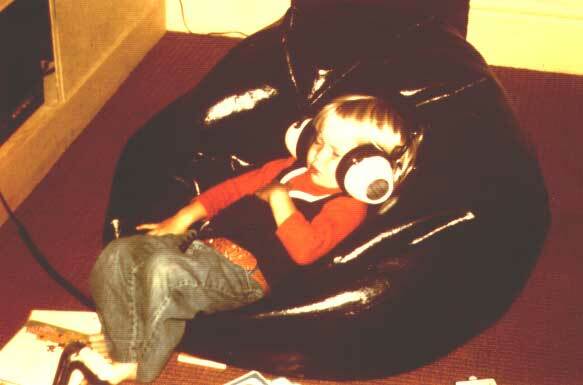 The author, probably listening to a Sesame Street album, mid-1970’s. I have been obsessed with music since I was about eleven years old. I have played guitar – mostly in the proverbial woodshed, occasionally in front of people who paid to be there. I have spent tens of thousands of dollars and as many or more hours over the intervening decades on music – guitars and amps, concerts and lessons and (mostly) on records and tapes and cds and digital files. It’s come to a point where if someone at a party asks me “So, what kind of music do you listen to?” I no longer have a clue how to answer. What I do know is that NOW is an incredibly interesting time at which to engage with – and write about—music. I will (and frequently do) argue that there is more interesting music happening right now in the world than at any time in history, and I want to learn more about it ALL. What follows is a snapshot, my view of the ‘industry’ as it seems to be. Like all businesses intimately tied to technological advances, the music industry has undergone a whirlwind of change over the last 25 or 30 years. In the early 80’s, compact discs were still the province of early adopters and audiophiles, cassette tapes ruled, and vinyl was still widely available but could feel the winds of change blowing coldly up its sleeve. In the late 90’s and early 00’s mixtapes gave way to mix cds which in turn surrendered to the entirety of the Internet as a way to share music. Only in the last ten years or so has broadband Internet access become commonplace enough to support direct, digital music sales to consumers (and illegal file sharing, natch). However, format changes had occurred with relative frequency throughout the life of the industry (cylinders to 78s to 33s to 45s to 8-track to…), and it seems that the industry treated the move away from cds and the growing popularity of people storing their music collections on their computers as just another incremental change. This shift to digital formats caught the industry, with few exceptions, completely flat-footed. In fact, it took Apple holding on to a tiny-but-hip share of the PC market and the worldwide boom in cheap, hi-tech cell phones and similar devices to keep the industry as a whole from tanking even worse than it has. Even with pay-download services, streaming sites and other new delivery concepts, revenue for the big players in the industry has plummeted. The combination of this drop in profit and the consolidation of most labels under a couple of enormous conglomerates has resulted in hundreds, maybe thousands of professional musicians being dumped from their contracts. Furthermore, the artist’s share of the revenue pie, always a tiny one, has shrunk in proportion to the whole. In the short-term, this is terrible for the artists. Yet, amidst the conglomerates, purges and plummeting sales there are interesting bright spots: sales of vinyl albums have skyrocketed, live music seems to be an eternal growth industry and digital distribution services allow literally anyone with a recording and a few dollars to put their songs a click away from the entire music-listening world. In fact, if there’s justice in this crazy mixed-up world, iPhones and ringtones and Spotify won’t prevent the entropic forces swirling around the Universals and Sony-BMGs of the world from pulling them apart at the seams and ushering in a new, smaller, better music business, one that seems to (sort of) already exist. On the downside the loss of profits mean that the labels that are out there aren’t going to spend money to develop artists like they once did in the glory days; they’re not going to spend money on marketing an album unless the performer is a proven commodity. So what DOES the artist do to engage an audience? What does the independent label do on a low- to-no budget to help get their artists out there? There have to be as many stories about the new frontiers in guerilla marketing, self-publishing, independent promotion and the struggle to be heard as there are languishing MySpace pages. I hope to have the chance to tell some of them here. The music industry has never been a model of propriety or fairness. From the beginning, artists were treated like indentured servants, and things haven’t really changed much in the intervening 90 years. Writing stables and payola have given way to production teams and independent promoters, but the effect is the same: homogenized music blankets the airwaves, and the “safe” artists – the ones the companies think are most marketable – get the vast majority of the marketing support. Artists are signed to ridiculous long-term deals, which generally require them to reimburse the company for all expenses related to the recording, marketing, and promotion of their material. In what other modern industry (besides publishing) are employees expected to pay for all the tools needed to perform their work? Let’s put it in “regular folk” terms: I get hired to work an office job and, on my first day, am handed a fifty-five page contract to sign. When I mention in an offhand manner that my car is eternally in the shop and I had to take the train to work, the boss hands me the keys to a new car and shows me to a workstation. What I may or may not realize (depending on whether I had the money to hire a contracts lawyer look over my contract) is that the car he just “gave” me and the cost of everything I use to do my job – the computer, fax machine, phone, phone service, paper, pens, printer ink, etc. – will be deducted from future earnings, and I won’t see a dime until it’s all paid off. Oh, and the contract included a non-competition clause, so I can’t quit before the end of the contract and go work for a competitor, AND I’m not allowed to see the details of what I owe and what I’ve made, AND when I do finally leave I don’t have the right to profit from anything I did while working there. Yeah. Welcome to the rock n roll dream. So, what DOES the rock n roll dream look like now? Is it a light-duty day job, tours on the weekends and an 8.0 in Pitchfork? Is it getting twenty seconds of your song on a popular TV show and parlaying that into record sales? Is it going back to the roots of the business and road-warrioring your way to a fan base? It’s more of a multiple-choice question than ever. It is quite simply not a musician friendly industry and never really has been. Songwriters have it marginally better, sometimes: if you write your own music (and haven’t signed away most or all of your publishing rights), you get a decent return on any recordings of your songs. But the performers, the rock stars, so to speak, generally only make a few pennies on each copy of an album or single. Michael Jackson got a couple of dollars per copy of “Bad” that was sold, and that was seen as a huge deal back then. So, sure, it sold multimillions and he did OK for himself – but what about the average artists that didn’t record “Thriller” last time out? They get hosed, pure and simple. In fact, their best shot of making money is touring, where they can negotiate their own cut of the gate and (again, if they haven’t screwed up and sold it away) use their merchandising rights to sell t-shirts and whatnot at the shows. This is why all those 70’s and 80’s heavy metal bands that never got songs on the pop charts lived like pashas – because every pimply-faced Trans-Am jockey that bought their albums also went to their concerts and while there bought t-shirts, buttons, posters, headbands, stickers, mirrors (yes, mirrors. The ones with the logos on…oh, never mind), etc. The occasional gold or platinum album was nice, but it was the merch that paid for the strippers, the coke and the gull-wing Benz. To be sure, the days of musicians buying castles with the proceeds of their talent are almost certainly gone forever. But the Internet-centered connectivity that has become so ubiquitous as to be invisible has allowed musicians a direct connection to their audiences that will allow those audiences to act as their own A&R person, to decide, en mass or in their cultish dozens, what will be the next feelgood hit of the summer or who will be the next hip indie darling. So, what DOES this connectivity mean to music? Between the laptop loner mixing her next single and the major labels is a vast expanse of the ‘industry’ that seems to be rolling with the changes and maybe, on a smallish scale, thriving. Mail-order vinyl-only record labels, original music venues, locally owned record stores, even boutique amplifier makers are legion and seem to be making a real go of it. Are they? How? You’d think that the master-slave dialectic the big record companies have employed over the years would have put them in a good position. But generally it hasn’t, especially since major corporations that have no experience in the arts have taken them all over. Seagrams, or whoever, buys up a label and thinks that they can increase profits using the same methods they did selling tonic water or light bulbs or whatever. And, sure, there are probably some operational aspects of the music industry (distribution, manufacturing) that a bunch of MBAs could improve; however, the obvious thing that they seem to ignore is that music isn’t like tonic water or light bulbs. It’s ephemeral, weird, both far more and far less important than regular consumer goods. Attempts to predict what music the public will want are exercises in futility so the businessfolk now running the labels have tried to dictate public taste and have, to be honest, succeeded, in a way. They have the advantage of owning or having access to a wide array of media delivery systems, and they have the financial power to utilize them in a sort of carpet-bombing technique. How DOES the modern musical artist engage with ‘the majors’? Are there ways for smaller acts, mid-level bands, independent songwriters to engage with Behemoth and come away (relatively) unscathed? Of course success stories can be wildly entertaining and occasionally edifying, but near-misses, small victories and downright disasters are more intriguing. Let’s talk about that. Let’s not worry too much about genre, or region, or scene. Let’s get in the van. Let’s rock. In recent years big name artists have signed “360 deals” with these huge companies, in which they do receive funding for their projects in exchange for a percentage of whatever they make doing, well, anything they decide to do. I have yet to hear someone explain how this is different from any typical major label record deal from the last 50 years in any way other than scale. Well, they used to be able to do this, before almost every major venue in the United States became the exclusive domain of either Ticketmaster or LiveNation.